AB 4.6.0 OC scanner does not test voltages above 1.000mv? Discussion in 'MSI AfterBurner Overclock Application Discussion' started by nicolaj, Mar 24, 2019. Running oc scan on my 1070 i noticed a weird behaviour. Another thing i noticed, when you're finished with a scan, you get a curve. But when you hit apply, the curve changes slightly. The only difference between these two curves is that i hit the apply button. Rest is done by afterburner. It looks like it's snapping the values into the 12mhz steps, but that is not the case, the values were already at their accepted 12mhz step. Oc scan results says 1.075mv for 2037mhz, clicking apply changes the values so it will now run 2037mhz at 1.025mv which is not the result oc scan came up with. A rescan will yield the same result, and apply changes the results every time. It also changes for other values, but i'm only mentioning the highest one. As mentioned we also see on the voltage measurement, that oc scan never actually test neither 1.025 or 1.075mv. And one more time for new forum visitors, OC scanner is NVIDIA's internal proprietary implementation. There is more to this problem though, the whole problem on a fundamental level is how easy it is for a user to understand, including finding information that shows them how it works. The limited knowledge of users is making this situation happen over and over. In probably the 3 or 4 dozen people I've helped at this point NONE have understood this behavior. That is a problem... I realized if they knew where to look to have the behavior explained they'd do so immediately. 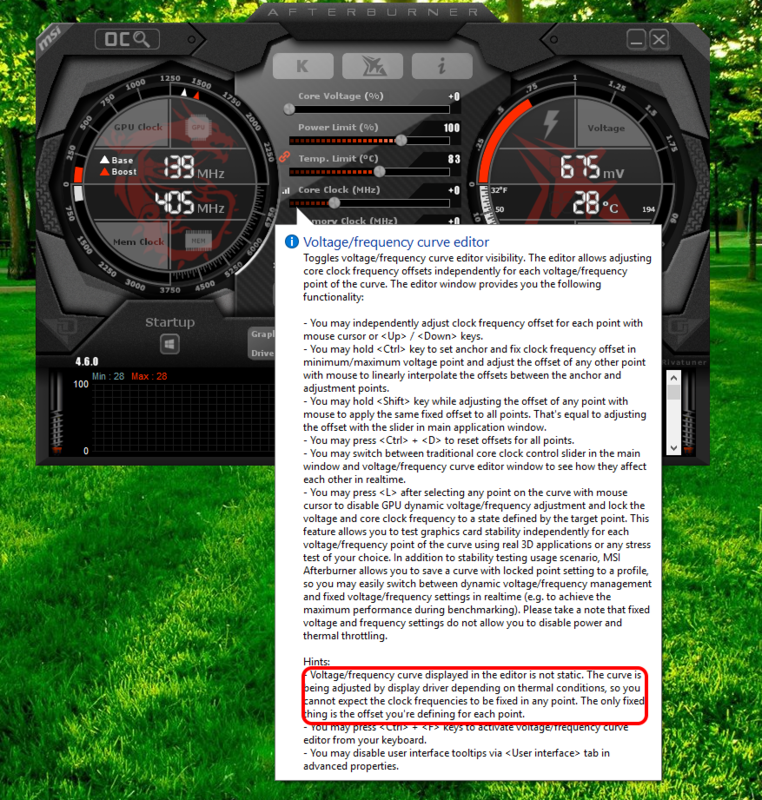 Most users see this behavior and are confused because they are under the impression of "Only MSI AB is monitoring and controlling these clocks". Aside from that people have learned that clocks can throttle from heat and power under load, and assume what they set their clock to will be the baseline, and any throttling will happen on top of that. That's a pretty simple and intuitive concept and has been how things worked until the 1000 series. Someone upgrading from a 970 to a 2060 sees they can control a curve of points at different voltages. Which is interpreted as = "Oh cool so when it throttles it will step down to lower voltages and I can control what clocks are at those voltages". But that is not how it works on Boost 3.0 and only if they happen to see the graph open to see it changing during gameplay will they notice voltage and clocks are not linked. But lets assume they have figured that out because they are playing with the curve under load to overclock. So now make a change to the curve, and HIT APPLY and suddenly the curve has changed completely. Now they are confused because they don't understand temperature changes BELOW the temperature limit can seemly throttle the entire curve, and even more perplexing and illogical to them is that the curve doesn't retain the shape as it moves up and down from this.MOVE the entire curve. For extra confusion making it even less likely someone understands the logic, people making changes to the curve are doing so to achieve a certain clock, but the changes result in different results depending on the temperature at the moment. It's intuitive to you because you understand it very deeply, but most users don't even have the foundation to make the logical connections about how it's working just from observing it. And of course they'd like to understand it better which is evidenced by the constant posts about this over and over. 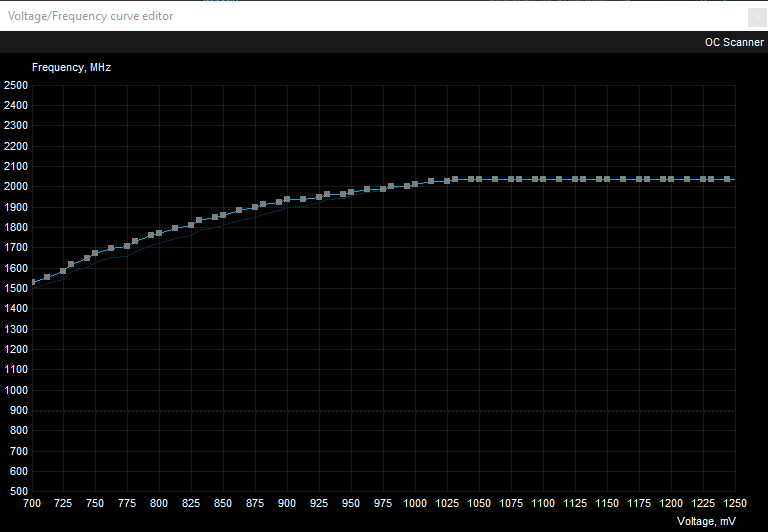 I'm honestly still not exactly clear on how Boost 3.0 affects the curve, I just try to aim for 2114-2126 @ 1.093 and a step down for the next few voltage points and call it a day. Just a brief explanation, even a small sentence directly ON the UI or in a pop up or anything about curve behavior would be immensely helpful in educating people. I know it is not your responsibility but you are the only person who can really make a difference in users understanding while they use MSI AB. Then at least when someone asks, they get immediately pointed to "look at the explanation provided!". I hope you understand where I'm coming from here, people DM me all day asking about stuff and it's one of the most common questions I get. Almost nobody understands why the curve can change. So again the whole problem on a fundamental level is how easy it is for a user to understand, including finding information showing them how it works. I personally hope you consider something that can change that situation. Thank you for reading! > Just a brief explanation, even a small sentence directly ON the UI or in a pop up or anything about curve behavior would be immensely helpful in educating people. Almost nobody reads the release notes, nobody reads context help. It won't help and won't stop it. Yes I agree, that's why i keep coming back to the idea of "put a sentence on the UI"- "CONFUSED? HOVER FOR INFO ON THE CURVE AND HOTKEYS" (that's a terrible sentence) but just SOMETHING to show that further information exists so those confused at what they are seeing would take a look. I tried to ask my friend "where would you look to understand more about how this works?" And no matter how I hinted at it or asked them they had no idea where to go and ended up frustrated and lost in random forums looking for information. A couple people had no idea Guru3d even existed! There is a "sentence on the UI" for it, directly in the context help popup for VF curve editor button.